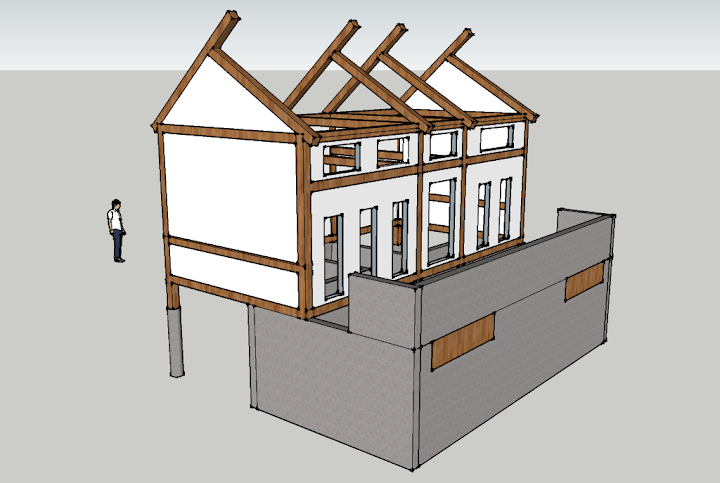 designing a home with Google Sketchup « How to make a friend in Uganda. NOV 2: Started sketching out a house on the back of a paper bag as I drank my second cup of coffee. 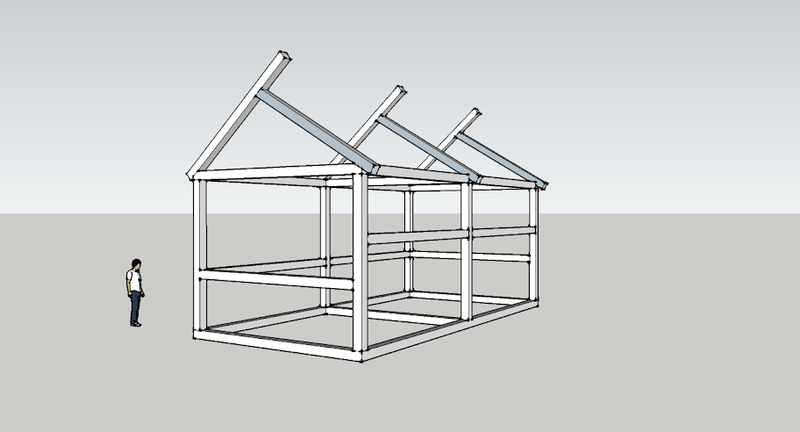 NOV3: Interested to see what it would look like in three dimensions, I spent a couple of hours this afternoon rendering the frame in Google Sketchup. 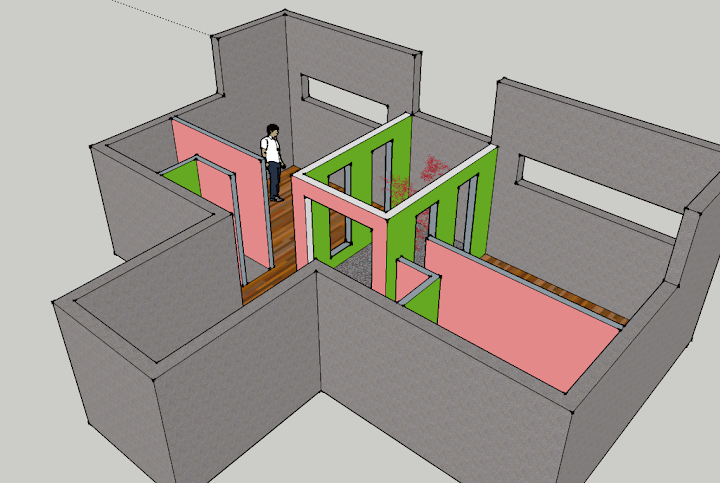 Over the next couple of days I plan to begin adding doors, windows, and, of course walls. 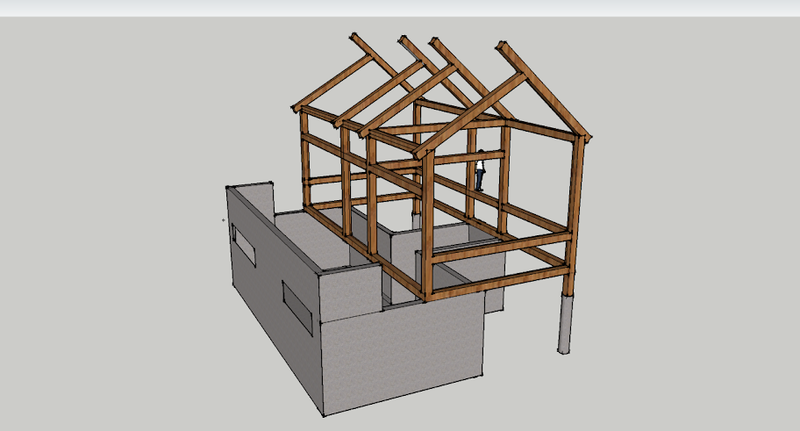 NOV 4: Changed the heavy framing plan and added a foundation plan to the sketch (below). NOV 5: Added walls and openings for doors and windows. NOV 6: Today I planted the gardens, added some floors, and installed other landscaping. This may help establish some needed perspective. 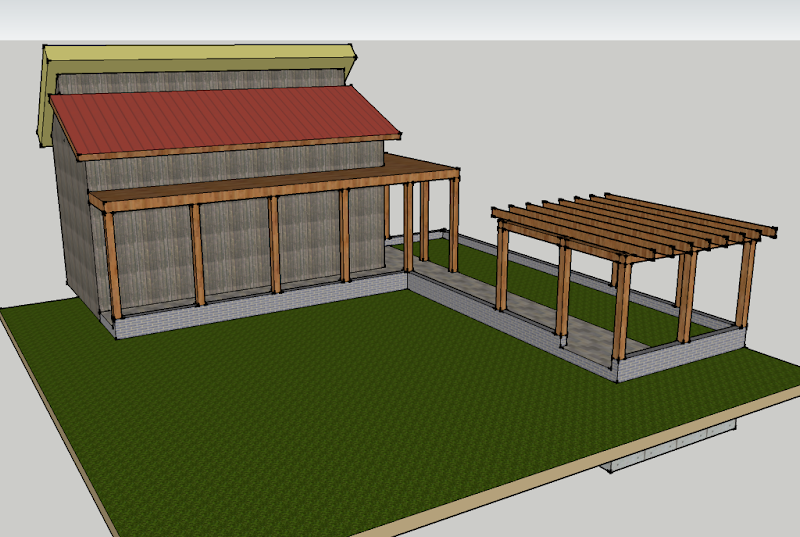 and, then I decided to add a roof. NOV 7: Today I sketched out a section of the basement to illustrate the relationships between the 2 bedrooms, the open courtyard, the bath, and the utility room. I got this idea from Stuttio Workshop who finished second place in the COEH Design Competition. 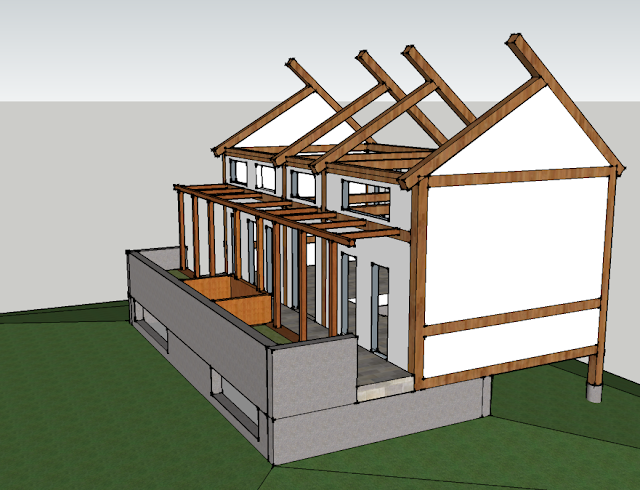 NOV 8: How to best integrate modern energy efficiency with timber frame structures has been debated since the U.S. timber-frame resurgence in the 1970s. For much of the past 40 years, exterior wall systems have been utilized, which add significant expense and unnecessary structure. My study of historic infill systems has led me to the conclusion that an infill system, using modern materials, would be a more effective and sustainable approach. A diagram of a wall section is includes below. 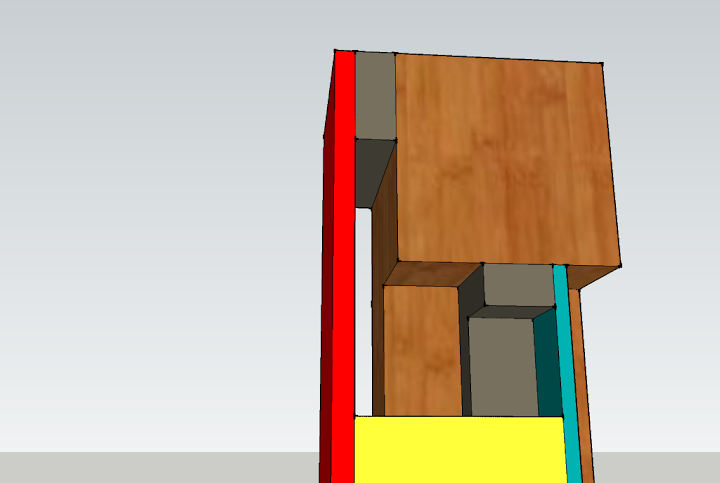 The exterior sheathing (red) and the interior finish board (blue) create a large – 7 inch – cavity that can be filled with any type of blown insulation (yellow). The 2X3 wall studs (grey) provide the necessary support. Notice that a wire chase is created by separating the exterior sheathing from the heavy timber; this gap also creates a thermal layer outside the frame, reducing energy loss. 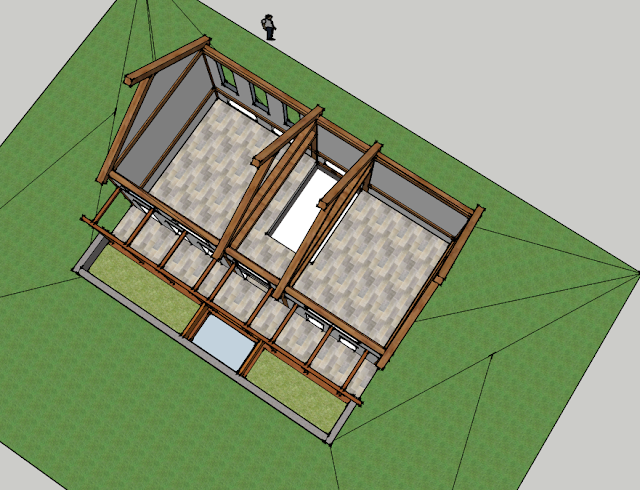 July 31: Sketched out an idea for additional bedrooms on the east side. 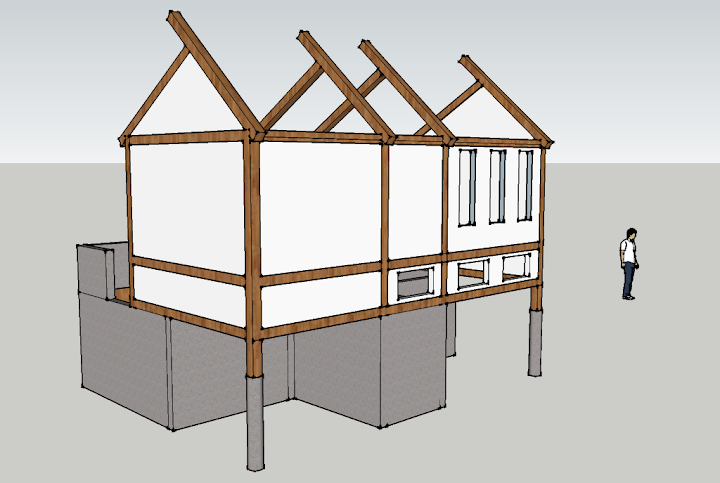 SIP panels might be good for infill – and could also provide some additional lateral bracing, i.e. shear panels to act as a secondary source of bracing for wind/seismic loading. Yosso – Thanks for your comment. The point of my light framing/insulation plan is to eliminate the need for manufactured structural insulating panels and address some of the problems associated with them. 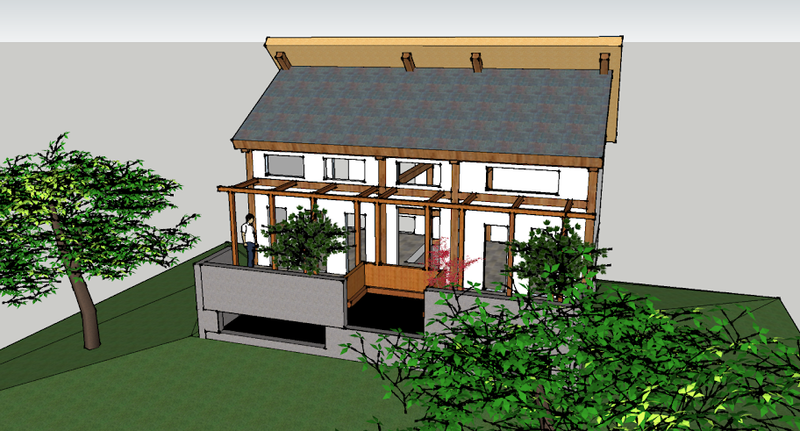 With the elimination of SIPs, any contractor can easily complete a home without any specialized knowledge or materials. An uninterrupted layer of insulation, a chase for wiring, and nailing surfaces for exterior sheathing and interior finishes are all easily implemented using conventional materials on site.